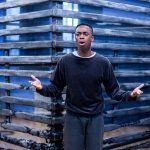 Hi Kwaku, you’re due to tour in Arinzé Kene’s good dog, which will start off at Watford Palace Theatre on 31st January. How are you feeling ahead of the tour? I’m excited to get started. Rehearsals have been a lot of fun so I’m looking forward to people seeing the show. It’ll be my first time performing at all the venues on the tour too which is great. good dog is a one-man show focusing on themes of multiculturalism and injustice; a reflection of reality. How have you found exploring these topical themes within the show? I really enjoy the research stage of rehearsals, and for good dog it was particularly interesting for me. We spent the first couple of weeks looking at documentaries, interviews, books, articles, anything that could give more insight into these themes. I’m a Londoner and obviously have my own connection with multiculturalism, so it was great to be able to bring that to the table, but there were stats about life in the city, particularly surrounding Tottenham and the 2011 riots, which really surprised me. It’s been a very eye opening exploration. How have you approached tackling the monologue? When you see the full text laid out on the page it does seem like a beast! I was a bit intimidated at first – it’s the most I’ve ever had to learn for a show, but once we broke it down into sections in rehearsal it actually became like learning any other kind of script. For me, it’s about lots and lots of repetition. Arinzé Kene has written the piece with a really distinctive rhythm which also helps. How do you find performing the show on your own? It’s also my first solo show. Being alone on stage can feel more exposing but the last play I did (‘The End Of Eddy’) was a two hander with direct address to the audience, so that helped prepare me in some ways. The relationship with the audience is really important in good dog, they almost become the other actor to bounce off. So it’s never lonely! What drew you to want to be part of the show? I’m a big fan of Arinzé’s writing so I jumped at the chance to be part of good dog. The central character is a young black boy trying to figure out the world in a really emotionally intelligent and perceptive way. He’s a complex character which is always a dream to perform. Audiences can expect a vibrant, funny, intelligent, moving and urgent story. I hope they take away a newfound admiration for the writing if they’re not familiar with it and a better understanding of the nuanced characters and themes presented. And of course a good night out. I’d say be interested in as much as you can. Obviously theatre, film, TV, art, music. But also things that aren’t necessarily performance related, podcasts, science, politics, knitting! Anything that gets you flexing your creative muscles and thinking outwards beyond just yourself is so useful as a performer.